Seven years ago, I cased the new school being built in my neighbourhood. I knew that there were seven different types of bricks, a staff room in the corner and an extra large classroom with a kitchen in the back. I peered through the windows anxious to see what lay beyond the walls. One day, I coerced a friendly construction worker to allow me to wander the halls. I held my breath as I walked room to room, the blue and yellow bathrooms, the pods that linked the upstairs classroom. It was a wonderful building, full of hopes and dreams of the amazing things that were to come. It wasn’t long before those walls rang with the shouts and laughs of children. Our young staff eager to build a school community on solid foundations of shared beliefs. We instantly became a family. At our opening day assembly our students barely filled half of the gym. A perfect “Storm” coming together for the first time. Seven years at “the Lakes” have flown by. I have lived life along side of some of the most incredible people I have ever met in my life. They are ‘my village’. The kids at ‘the Lakes’ have been my inspiration. Their creativity fuels my spirit. They have taught me the importance of inquiry, student driven learning, and the value of humour. They have kept me laughing (most days) and kept me thinking. They have challenged me and learned alongside of me. They have watched me fail and I have watched them succeed, and we have explored our passions together. They have been the best teacher I could have ever hoped to learn from. I have learned the importance of caring. I have learned the value of motivation. They have all become ‘my children’. Leaving “the Lakes” will be hard. Those walls are now filled with incredible memories. It will be an ending to a wonderful phase in my life. After The Storm comes the rainbow. I’m SO EXCITED!!!! One of the things I loved most about my job was when I was given the opportunity to lead professional learning. For a few years now, I have known that I wanted to do something outside the classroom. But I couldn’t figure out what. Then THIS came along! I am thrilled to be joining the DLRT (Digital Literacy Resource Teacher) team. I am eager to support modern learning in my board and to be a part of professional learning on a larger scale. This new beginning has so many unknowns. I am curious about what my day-to-day will look like, I’m uncertain about many of my roles and responsibilities, and I’m a little nervous about the wealth of information I will need to become familiar with. But I’m SO excited!!! This is another new beginning! I know I will be challenged. I know I will struggle, I know I will succeed, but most of all I will learn. I can’t wait to meet my new ‘village’. I feel like peeking in windows to see what the offices look like. I’ve been meaning to blog for a while, but teaching is such an odd profession. While most people assume things gradually ‘wind down’ at the end of the year, they instead actually ramp-up, before coming to an abrupt end. The last week of our school year was filled with the usual madness of moving classrooms, finishing report cards, saying goodbye to beloved staff members, and … something different: our virtual digital museum. “Hi, welcome to our virtual digital museum. We have been learning about First Nations people and European Explorers.”. 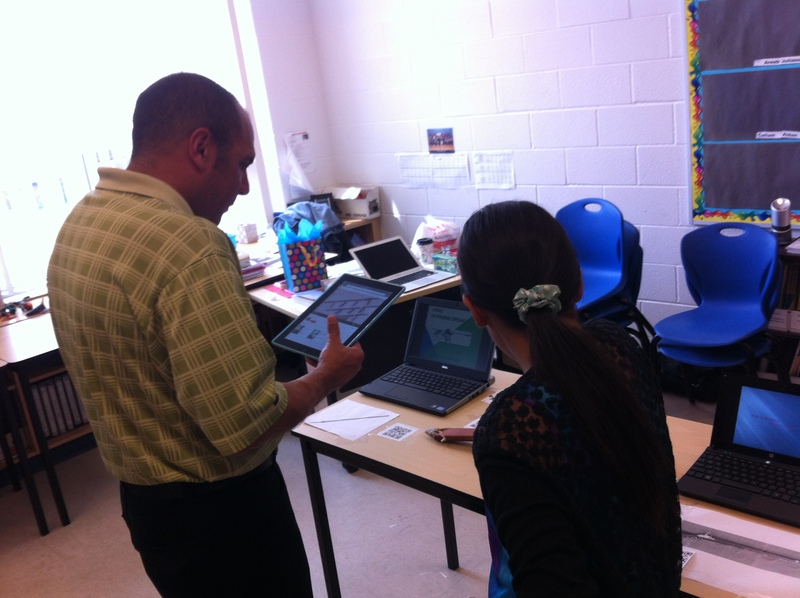 A student hands a visitor an iPad. “You can use the app “Scan” to explore the different displays”. 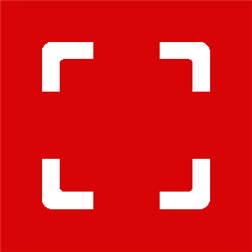 He confidently points to the red app with the white borders. “This is a QR Code Scanner, use it to access the different videos that will tell you about the artifacts on display.” One by one visitors enter the museum. The student hosts support, answer questions, and inevitably serve as ‘tech-support’ and ‘security’ making sure that none of the artifacts are manhandled. Students, teachers, parents, administrators tour the museum, scanning the codes and watching the videos. A buzz of excitement fills the room. It wasn’t that long ago when I sat with Melissa Murray (@MelissaMurrayYR) and she explained that the new Social Studies History/Geography Curriculum was about ‘doing the work of a historian’ , or ‘doing the work of a geographer’. What does that mean? What does it look like? What do historians and geographers do? How do they generate knowledge and understanding of the world, and the world that came before? In order to strengthen my student’s understanding of the impact of the contact between First Nations People and European Explorers, I wanted my students to act like historians. What do historians do? They discover artifacts/evidence of people from the past, and work to determine the story behind them. As ‘historians’, my students would work to create a museum of artifacts showing the different aspects of this period of history. The ‘artifacts’ they explored could be as simple as a bowl of salt, or a basket of beads or as complex as a mask, treaty, or map. The Concepts of the Disciplines of Thinking served as the framework for the students to build their inquiries around. They were to explore the Perspectives (Whose stories can we find out? ), Significance (Why was this important? ), or the Interrelationship (How did the environment affect the way they lived, or how did the way they lived affect the environment?). … and they were off! I love this part. The stage where I feel inadequate and overwhelmed, and yet empowered and excited. You can read about that stage of our inquiry here. Kids starting to ask questions to which I have no idea of the answer. Students exploring and questioning, students sharing and collaborating. Inquiry in motion! Searching websites, analyzing pictures, reading books, examining maps, and more. Doing the work of a historian! Uncovering evidence of the past and making sense of it! But, how could they truly share their understanding? Reports? Blah! Who wants to go to a museum and read pages and pages of reports? Would you? Do you actually read the plaques posted beside the artifacts when you explore a museum? How long is your attention span? Two minutes, maybe? 65 seconds? How long can an artifact sustain your attention before you want to move onto the next? What about videos? Can you watch a 60 second video and remain engaged? 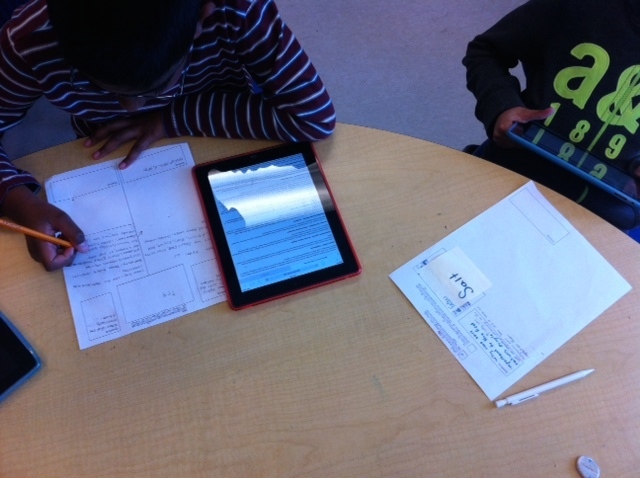 The students used iMovie to create video evidence of the information they had found. Each video focused on one of the Disciplines of Thinking (Perspective, Significance or Interrelationships). Creativity blossomed! Images, maps, voice-overs, music, text… amazing stuff! Once the videos were finished, sharing was easy! I uploaded all of the students videos to my private YouTube account, and linked each video with a QR Code. @Cohen_Michael_j learning about different weapons with a student guide. Virtual Digital Museum… in action. The result was a scannable interactive virtual museum. 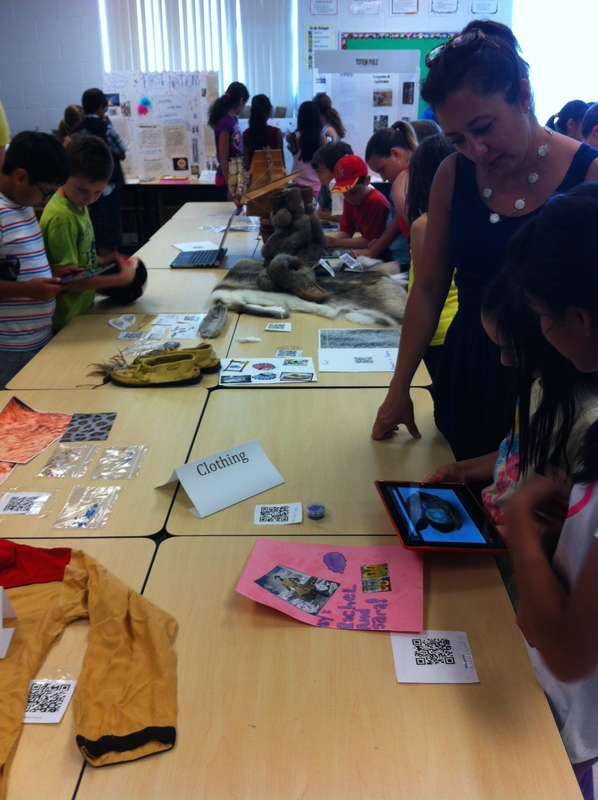 As the visitors explored the various artifacts, they were able to access the kid-created-content through QR Codes. 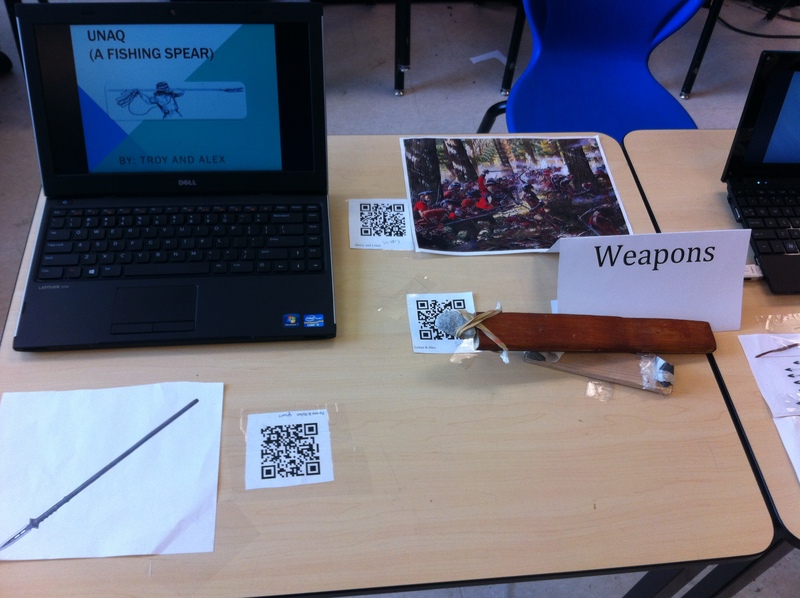 The part my students like the most, was the final QR Code that linked to a GoogleForm. Visitors provided immediate feedback to the learners by completing a quick survey before leaving. Wouldn’t it be cool to be able to interact with the curators of a real museum in this way? Imagine being able to explore, interact and respond to the ‘historians’ who curated the displays. After all, aren’t we all historians, making sense of the world around us? So, thanks Melissa Murray for pointing me on the path of “doing the work of a historian”… because history certainly came alive in our school! Holy moly! Learning is happening. A few days ago, I had my doubts, in fact, I was downright fearful about the direction this new inquiry would take. If you didn’t read my blog post from a few days ago, you can read it here. So here we are, two days later… And learning is happening! While I thought learning might happen, and hoped learning would happen, I am surprised to see such amazing learning emerging so soon. Student #2: “I started researching wars. 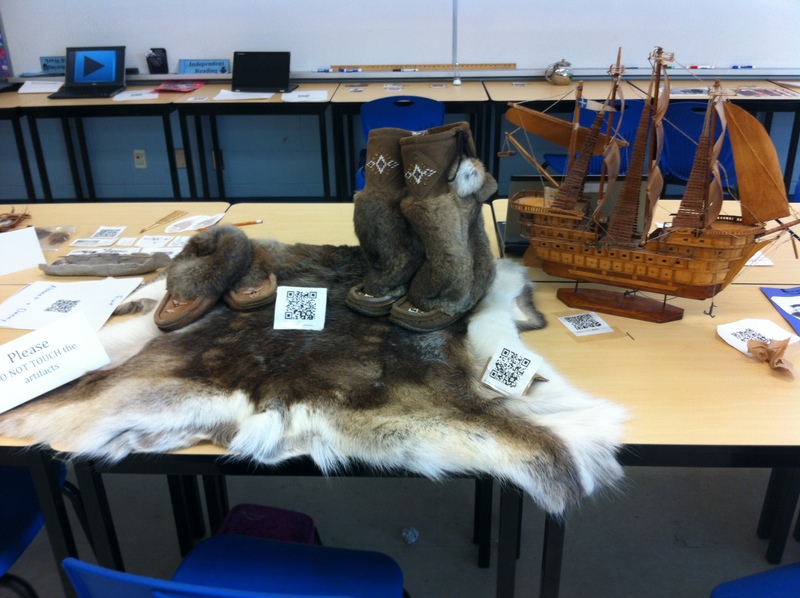 I wanted to find out about the different perspectives – like the First Nation and the European Explorer perspectives. But, when I found out about the Beaver War, I learned that the British and the Dutch sided with the Iroquois and the French sided with the Huron. It seems like the different European groups had different perspectives. Can I focus on the French and the English perspectives instead? Student #5: “Did you know that spears were different in different tribes? I wonder if they were different because of resources or the ways they used them? Can I focus on the interrelationships between the type of spear and the place where they lived? Learning is happening. It’s working. I feel like I’ve started a wheel in motion and my kids are digging in. I thought it might happen, I hoped it would… But in this moment, I’m completely surprised that is has taken root so deeply, so soon! At the end of our last unit of inquiry, I remember the amazing feeling of contentment that settled over my class: A sense of pride and accomplishment. The students had dug deeper and engaged in richer learning than I had ever witnessed before. Looking around, and reflecting on their learning, … the view was spectacular! Starting a new inquiry ….It’s full of curiosity, interest and at times completely overwhelming. My stomach has a lurching feeling – a mixture of excitement and nausea. Having gone through unit long inquiries with my students before, I feel both better equipped and completely inadequate to start this daunting new task. Our first inquiry was an exciting unknown journey full of wonder and it gave us the freedom to dig deeper and think harder than we had ever done before. Now, at the cusp of a new inquiry, I’m feeling both eager and reluctant. I’m excited because I know the amazing learning opportunities that will arise. Likewise, I’m reluctant to plunge into the abyss of the collective unknown again. I know that embracing innovation and change is important, but there are times when being pushed out of my comfort zone, is, well, uncomfortable. Plunging into a unit of learning where I’m unsure of the exact path we will take is both liberating… and scary. Our classroom is covered with chart papers: Lists, questions, ideas, groupings. Our typical “Guided Reading” times have been replaced with “Guided Inquiry” and “Inquiry Research” replaces “Independent Reading and Writing” times. 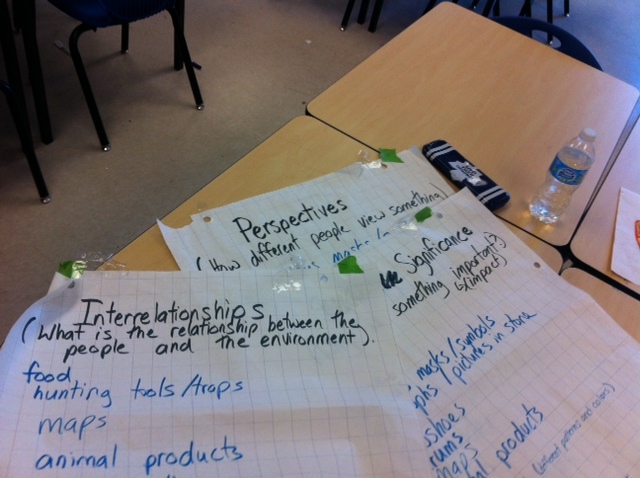 Yesterday, I sat with one group for our first Guided Inquiry time together. As I pulled up a chair, I looked into the faces of my students. “I’m a little nervous”, I admitted. “I’m not quite sure how this is going to go.” I said cautiously. A smile broke across one of my student’s faces. “Me too.” She said. “What’s your starting point?” I asked…. “Let’s go from there.”… and the conversation grew, questions started to form, ideas began to take shape. Before us, the initial path to discover began to appear. All of the learning I have done this year around the new SSHG has taught me that students are to ‘do the work of historians’, or ‘do the work of geographers’. Well, how exactly do historians do their work? They start with the evidence in front of them and figure out what it all means… by asking questions and digging (sometimes literally) for answers. This sounds familiar… Ask questions, and search for answers… Inquiry!! As my students explore the various elements of Heritage and Identity (Communities in Canada, Past and Present), they will do just that. Begin with artifacts (something concrete) that show that someone (or some group or people) came before and search back through time to determine it’s historical value. Perspective: Who’s stories can we uncover? Significance: Why was it important? What was it’s impact? Interrelationships: How did the environment effect the way people lived? How did people effect the environment? Simple… and yet complex. Exciting… and overwhelming. All at the same time. In the past two days, I have met with four of the five groups. Some groups buzzing with excitement, and some seemingly paralyzed by the openness ahead. “What’s your starting point?” … Starting with something concrete (an artifact, an image, an item, a map, a painting)… and working backwards through the sandglass of time…. Right now, at the start of a new inquiry, the lens is muddy, the path promises to be wide and overwhelming at times… but hopefully, the destination will be well worth it. Because, when we reach the end and are looking back, I know that the view will be spectacular! For years, teachers have used the strategies outlined in The Daily 5 to develop strong independent routines during their literacy blocks. Read to Self, Work on Writing, Word Work, Listen to Reading and Read to Someone, have become staples in many classes across North America. The foundation created by building these strong independent routines, enable teachers to create rich literacy programs that provide students with authentic opportunities for applying and consolidating the learning that takes place through small group or guided instruction. In the last week, I have had the opportunity to read through the New Daily 5. While the core elements of literacy remain the same, the authors have added more flexibility and depth to the familiar five tasks. 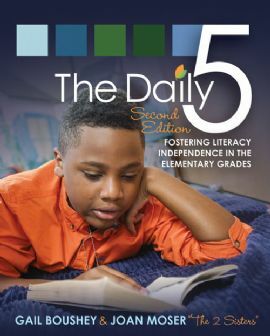 When I first started working with the Daily 5, I wondered how I could intentionally connect these strong independent routines to the learning that was happening during Guided Reading and Writing Conference sessions. That was when I built AWARD Time (Applying Reading And Writing Time). Through AWARD Time, teachers are able to purposefully and intentionally connect the work that students are doing independently through the Daily 5 activities, to the learning that is taking place in small group guided sessions. With this model, the Daily 5 tasks become a part of a learning cycle that allows teachers to assess student’s learning, and respond immediately to the needs of their learners. With AWARD Time, students transition seamlessly from independent learning tasks, to guided learning times and back again. AWARD Time, builds in opportunities for students to apply and consolidate their learning, as well as providing purpose and accountability through their independent learning tasks. AWARD Time is based on two cycles of learning; the first, a Reading Cycle. 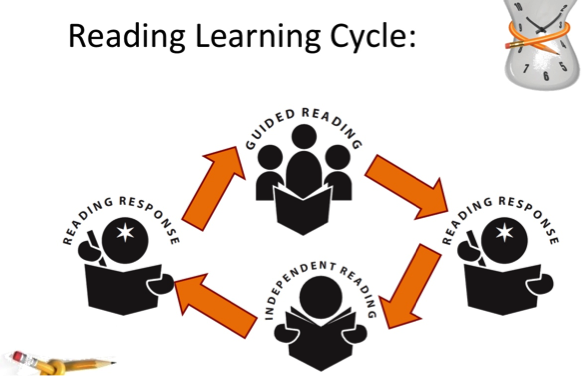 This cycle provides opportunities for teachers to intentionally connect independent tasks such as Independent Reading and Reading Response to Guided Reading. This allows students to immediately apply and extend the skills that they are learning through Guided Reading to their Reading Responses and Independent Reading. The “Reading Cycle” is complete, when the students return to Guided Reading, and the teacher is able to assess the student’s Independent Reading and the learning that has taken place. Teachers can then use this in order to drive the next cycle of learning through through Guided Reading. The second cycle is a Writing Cycle. Through this cycle of learning, teachers are able to use Writing Conferences as a way of monitoring students writing, and provide timely descriptive feedback that students can use to set individual writing goals. 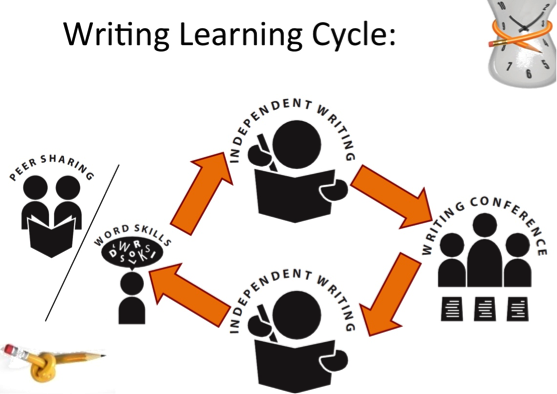 This cycle intentionally connects Independent Writing to Writing Conference times as well as Peer Sharing and Word Work. This way, students can share their work and receive timely feedback from their peers, as well as always having an authentic audience and purpose for their writing. Building Word Work into this cycle enables students to build word skills based on the words they are actually using in their daily writing. Finally, through 100 MINUTES, teachers are able to see ways that these independent tasks could fit into an complete balance literacy block; finding times for whole group instruction in reading and writing as well as authentic applications of technology in the classroom. 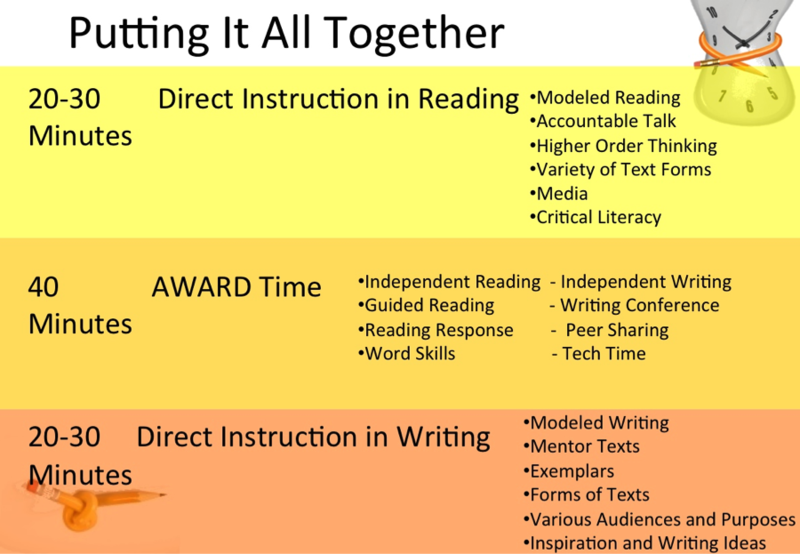 Add in higher order thinking, accountable talk and opportunities for student choice and inspiration, and students are certain to be engaged with rich learning throughout the entire literacy block. As I read through the “New” Daily 5, it became abundantly clear that these strong independent routines provide the solid foundation for 100 Minutes. 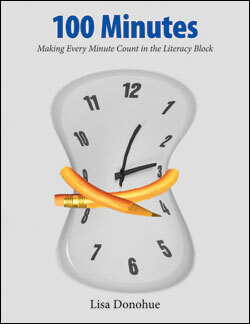 100 MINUTES is the next logical step in order to connect all learning activities together in the most effective and meaningful way possible. My mind is reeling as I sit down to write this post. My journey into inquiry and learning has been vast, profound and at times overwhelming. As I wrap up our first Social Studies unit, using the new Inquiry Framework, I’m not sure who has learned more, my students or me! Maybe the best place to start is at the end, and work backwards. Last week, my students gathered together to host a “UN Issues Summit” to discuss a number of pressing global issues and the role that Canada plays in these issues (Grade 6 Curriculum). As a group of nations, they were also to determine how they would allocate funds (10 Million dollars), in order to support five of these issues. They needed to prioritize and debate until they could decide which issues they felt were the most pressing, and then decide how to divide the funds among them. The debate was heated to say the least! Imagine one student pacing up and down the back of the classroom, trying to calculate the mathematical relationships between the number of votes each issue received in relation to the portion of money to be divided. Another student, adamantly declaring that four people’s votes had been discarded when the top five issues were selected. The debate raged between which was more important: children’s rights, climate change, racism, nuclear waste, coral reefs, endangered species, education, girls’ rights, or wars. Students were synthesizing their knowledge, making authentic connections and pleading for the rights of others around the world. Where was I in all of this… I took a step back and allowed the process to unfold naturally. I let the students run the meeting, decide who would talk next, and how they would come to a final decision. Chaos? A little bit. But talk about passion and conviction, engagement and application of knowledge – I sat at my desk in absolute awe of my students. I placed country cards on each student’s desk, identifying him/her as a representative of one of the countries in the UN. If they were to address the group, they needed to stand, state their name and their country before proceeding. The students loved this ‘formal’ style and it added to the level of respect and feeling of responsibility in the room. In preparation for the Issues Summit, each student (or pair of students) was responsible for researching and presenting a global issue that they felt passionate about. The Disciplines of Thinking in the new Social Studies Curriculum, created the framework for their inquiries. Students needed to formulate questions that addressed three of the Disciplines of Thinking: Perspectives, Cause & Consequence and Interrelationships. This helped students create a balance in the type of information they were seeking, as well as providing opportunities for them to think deeply about the issue they were researching. They prepared a presentation to share with the UN about a global issue and ways Canada is involved in responding to it. This presentation was as open-ended as possible. Some students chose to make iMovies, some PowerPoints, and others speeches. 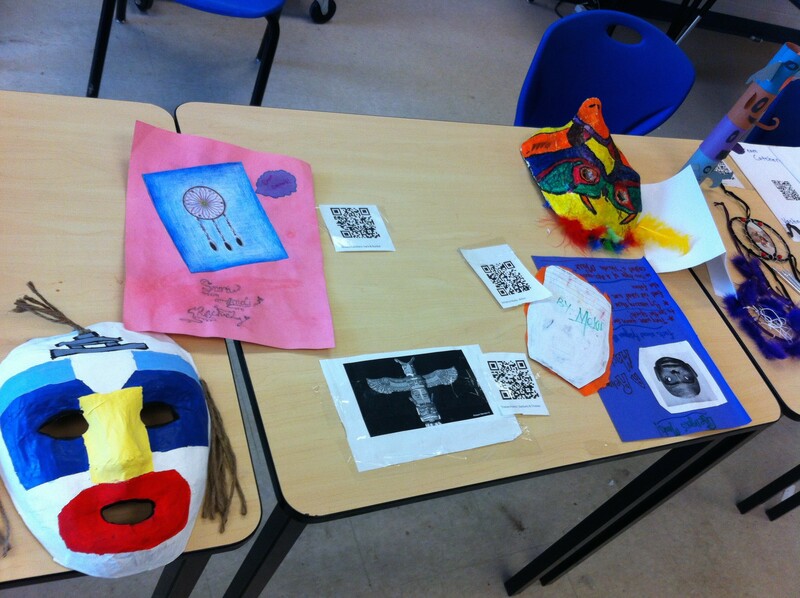 They were encouraged to be creative and share their learning in whatever way they felt comfortable. In one of my blog posts, Questions Are Central, I thought about the central role of questioning in the Inquiry Process. As we got into our unit, the more convinced of that I became. Even as students were sharing their ‘final’ pieces there were more questions raised and more new paths to explore. During the Issues’ Summit, one student responded “I’m sorry, I don’t know, but would it be okay if I found out and told you tomorrow?“. While we all moved on, I was dumbstruck to overhear a conversation the following day at lunch time. He approached the student who had asked the question, to say “Do you remember you asked me that question yesterday, I want to share what I found out….”. and the lunch conversation revolved around this student’s new discovery. If this is not a measure of student engagement, I’m not sure what is. There has never been a time when the importance of differentiated instruction has been more obvious than through this unit of study. There were some students who were able to take an idea and run with it – only needing to check in with me occasionally, and there were others who needed to sit with me almost every step of the way. I used a ‘guided inquiry’ time – similar to guided reading – where I would pull a small group of students and work with them to revisit their questions, identify key words to search, analyze sources for accuracy or relevancy, interpret the information they encountered. I needed to teach mini-lessons about how to search for information, how to summarize, cite, quote and reference information, how to synthesize and make connections, and more. It was critical thinking in action. It was authentic literacy in action. It was a way for students to apply their reading and thinking skills. We worked together to use a graphic organizer to gather and organize information, and represent their learning through their presentations. I know without a doubt of hesitation, that my students have a much deeper understanding of the Social Studies curriculum that I could have ever ‘taught’ them in traditional ways. They were all invested in their learning and developed a passion and awareness for the content. The levels of engagement skyrocketed in my classroom, to the point that students were begging to use their ‘free time’ to continue their work. The students became the experts in the classroom. I found myself comfortable with the fact that I didn’t know the answers, and often, I wasn’t even sure where to look, but we could try to find out together. My students respected the fact that I was a co-learner with them. They appreciated being able to teach me things, and show me the sources for their new found learning. Behaviour was not a challenge. While there are often times in my class when I need to redirect off-task behaviour, this was not the case during this unit of study. Every student was able to achieve! Every student was proud of their work, and every single one had a solid understanding of the overall expectations in the curriculum. As I wrote their report cards, I wondered how to capture the difference between ability and achievement. There were some students who were able to dig deeply into their research independently. They took initiative to research on their own time, to actively seek out information and to creatively and passionately create their presentations. And yet, there were others who needed me every step of the way. The role of differentiated instruction played a huge part in their success. Without direct support and guidance from me (or other teachers assisting), they would have struggled to complete their presentations. However, in the end, we are not evaluating the process – but their achievement and understanding. Through this differentiated process, they were able to achieve the expectations set out for them.. but how is this reflected in their final grade? Should a student receive a “B” if they have been able to demonstrate a good understanding of the curriculum, even though it took almost daily support to get there? Is this different from a “B” that a student would earn by demonstrating a good understanding while working somewhat independently? It is my job to ensure that every student meets with success, and to that end, I am happy. I am however, still reflecting on how to accurately capture this when assessing an reporting. Maybe you have some ideas? Thank you all for joining me as I reflected on my learning through this process. The role of my PLN continues to grow in importance in my personal professional learning. I am so grateful that my learning extends beyond my classroom and school walls and allows me to partner with likeminded educators, wherever they may be. Thanks Aviva (@avivaloca), Nikki (@MsTown), Jo-Ann (@6Chotline), Beate (@bmplanche), Louise (@Robitaille2011) and #ontsshg for being a part of my ongoing learning journey into inquiry!! It’s so nice to know that support is only a tweet away! December 14th marked the one year anniversary of the tragic shootings at Sandy Hook Elementary. Last year, on that day, like every parent, I held my breath, mourned the loss of the innocent children, and held my own kids closer that night. A tragedy this close to Christmas, reminded me of the pain of seeing unopened gifts under the tree long after the ‘celebrations’ had ended for the rest of the world. A year later, as we paused to reflect on the day, and the families whose lives were changed in an instant, we were asked to “do a good deed” in memory of the children. At school, I have the onerous task of bus duty almost every morning. This virtually consists of greeting children with a smile, directing traffic and trying to protect my rapidly cooling coffee from the harsh northern winds. However, every morning, I am awed by the life-lessons clearly demonstrated by a three-year little girl (let’s call her Grace). Each day, Grace and her mom walk her older brother and sister to school. Some days, Grace carries her own ‘baby’ with her, pushes a stroller or insists on carrying a little pink purse to match her little pink boots. However, Grace is never in a hurry. Regardless of the traffic, the bell, or my rapidly cooling coffee, she takes her time every morning to hug her brother and sister goodbye. She hugs them one at a time, kisses them both and tells them “Have a good day; I love you”. This is such a gentle daily ritual, something I’m sure she (or her family) have no idea that I consider myself privileged to observe. Every morning, as I watch her lovingly say ‘goodbye’ to her big brother and sister, I think back to the last thing I said to my kids before I hurried out the door. Was it “Don’t forget your permission form!”, was it: “You lost your gloves… again!”, was it “Don’t forget to brush your teeth!”… I wonder how many times, the last thing I say to my kids before heading out for the day is: “I LOVE YOU!” Life’s busyness gets in the way, and I forget to take the time for the things that are most important. Grace may be only three years old, but she has taught me a lesson I hope to never forget. As Sandy Hook showed us, life can change in an instant; forever altered and shattered in a moment in time. I want to embrace life like Grace: with grace, patience, love, gentleness. This year, as I remember the families of Sandy Hook, I hope that I will always remember to hold my kids close, tell them I love them, and embrace the little moments in life.